Reggie is the director of the James Island Masters Studio. He is a 5th Degree Black Belt in the art of Shaolin Kempo and a certified instructor in Tai Chi, Kung Fu and Fitness Kickboxing. Reggie also trains in Wushu and Wushu Weaponry. In 1981, Reggie began studying kempo at Fred Villari’s Studios in Boca Raton, Florida. Reggie received his training up to the 1st Degree Black Belt under the instruction of Master Herb McNeil. He received his training up to the 3rd Degree and his instructors training under Master John Fritz. In 1986, Reggie relocated to Columbia, SC where he continued to teach his chosen art of Shaolin Kempo. While there he also studied the ED Parker Kempo system for a while. Reggie believes Villari’s Shaolin Kempo and Parker’s American Kempo are both excellent styles. Together they make and unbeatable combination. Reggie recieves his Tai Chi training from Laoshir Joshua Grant. 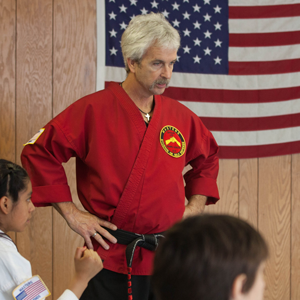 Joshua is the director of the Tai Chi and Internal Martial Arts program at the Boston Kung Fu/Tai Chi Institute. Reggie receives his Kung Fu and weapongs training from Sifu Yao Li. Yao is also a director of the Boston Kung Fu/Tai Chi Institute. Along with being a professional martial artist, Reggie is also a musician. He enjoys writing and playing his own music. He also enjoys Christian music and secular songs that contain a positive message. Reggie has recorded and produced a cd of his original music. “Feel The Spirit” is a compilation of Contemporary Christian songs Reggie has written through the years. His music comes from the heart. He has put to music some of his thoughts and lessons learned along the way. “Feel the Spirit” will touch and move you if you will open your heart. You can obtain a copy of “Feel the Spirit” for $10.00 by simply emailing Reggie with your request. the instruction of Master Roger Jarrett.